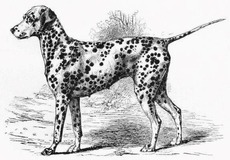 There are many theories surrounding the origin of the Dalmatian, which is the only such uniquely and distinctly spotted breed within the vast array of canine species. The most common idea (and indeed the one the FCI has adopted) is that the Dalmatian originated in Dalmatia (a region in Croatia), hence the name. Extensive research by Dr. John H. and Monica Brooks (co-authors of ‘Dalmatians In Canada’), Patches Silverstone (author of ‘Dalmatians Today’), Dr. David Hancock (author of ‘The Heritage of the Dog’), and others, failed to find any evidence of Dalmatians in Croatia, which has thus been discounted as the country of origin of the Dalmatian breed. The Brooks thoroughly researched the Dalmatian/Croatia question, and provide compelling evidence in their book , which I quote. However, since the discovery of the gene responsible for hyperuricosuria in the Dalmatian, and the development of a genetic test, it has been revealed that the Dalmatian is not the only breed carrying this gene mutation (SLC2A9), and in fact various genetic testing companies and scientific research papers list multiple breeds carrying this allele. These include American Bulldog, American Pit Bull Terrier, American Staffordshire Terrier, Australian Shepherd, Belgian Malinois, Black Russian Terrier, South African Boerboel, Bulldog, Dalmatian, Danish-Swedish Farmdog, Drentsche patrijshond (Drent), German Hunting Terrier, German Shepherd Dog, German Shepherd Dog –Longhaired, Giant Schnauzer, Giant Schnauzer – Black, Giant Schnauzer - Pepper and salt, Golden Labrador Retriever, Hungarian Wire-Haired Pointer (Vizsla), Jack Russell Terrier, Kromfohrländer (non-FCI registered), Labrador Retriever, Lagotto Romagnolo – Romagna Water Dog, Large Münsterländer, Miniature American Shepherd, Mixed breed, Parson Jack Russell Terrier, Pomeranian, Jack Russell Terrier, Spaniel de Pont-Audemer, Spanish Water Dog, Swedish Vallhund, Weimaraner, Weimaraner – Longhaired, Weimaraner - Shorthaired. The only difference is that the Dalmatian breed is the only one found to date that is entirely homozygous recessive for this mutation. Other breeds so far identified still contain the normal allele within their populations, so not all individuals are affected in these breeds. This puts an entirely different spin on the relationship of the Istrian Hound and the Dalmatian, since the other breeds mentioned above are definitely not considered closely related to the Dalmatian. Rather than the mutation appearing independently in each breed, it seems much more likely this mutation arose before these various breeds were split off from the common ancestral canine stock, and thus its presence cannot be used to determine close relationship between breeds. It is instead a much older and more widespread mutation than was previously believed. A theory of how the HUU gene became homozygous in the Dalmatian breed is that the SLC2A9 mutation inadvertently became homozygous throughout the entire breed simply because the gene controlling lack of interspersed white hairs in ticked areas is physically present on the chromosome very near the location of the SLC2A9 mutation gene (i.e. they are closely linked,) and thus the two characteristics (HUU and clear spotting) were inherited together. Therefore, it was proposed that the HUU gene could have been inadvertently set in the breed by selecting for clear Dalmatian markings (i.e. bold round spots free from interspersed white hairs rather than patches or flecks). Worldwide searches for normal uric acid metabolism genes in the Dalmatian failed to find any copies of the normal UA allele in the breed, so this visual selection, if correct, was apparently extremely effective. 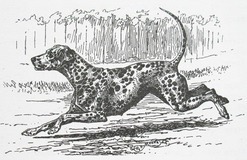 However, Schaible found from his Dalmatian/Pointer crosses that “The production of 5 puppies having normal metabolism of uric acid and absence of interspersed white hairs in the Dalmatian-type spots in the backcrossing experiments, demonstrated that the gene for the defect in uric acid metabolism was not required to achieve the spotting pattern described in the standard.” Thus, it seems unlikely that selection on the basis of clear markings alone could have removed all copies of the normal UA gene from the Dalmatian breed worldwide, since it has been shown these characteristics can be inherited independently, producing dogs with both clear Dalmatian markings and the normal UA genes. Instead, it is possible that any remaining normal alleles within the breed population were lost due to bottlenecks created by events such as the World wars, which left a much reduced breed population, and that the remaining individuals just happened to be homozygous for the HUU mutation. Another theory would be that the breed as we know it today arose from a very few initial individuals, which happened to be homozygous HUU (the founder effect). With regard to the ‘explicit similarity in genetic coat formulas’, the Istrian Hound has the extreme white piebald swsw coat pattern with lemon or orange colored markings, and while it may have speckles of pigment on the skin of the body, these do not come through as pigment into the hair coat. The mention of ‘spots’ in the Istrian Hound breed actually refer to patches of various sizes. Many breeds have this type of skin mottling and are not considered closely related to the Dalmatian. Both breeds have alleles B and b at the B locus, but Istrian Hounds are homozygous recessive ee at the E locus since they are all ‘orange’. The vast majority of the Dalmatian breed is homozygous EE, although the e allele also exists. Because the body speckles on Istrian Hounds do not come through into the coat, the breed is likely tt at the T locus, whereas Dalmatians are TT. In body type and behavior, the Istrian Hound is definitely a hound (including being very vocal on the hunt: “The Istrian Shorthaired Hound, or Istrian Pointer, is the older and more common variety, known for their persistent and sharp baying while hunting.”), quite unlike the Dalmatian, who coaches silently. Considering the forgoing ideas, it seems unlikely the Istrian Hound and the Dalmatian are particularly closely related breeds. 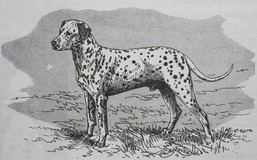 While references are made to Dalmatian-like dogs in very early etchings, paintings, murals, and friezes, these particular individual art items are also often claimed to be proof of the origin of other speckled breeds. The purported Dalmatians running with chariots were actually lions, which over the years became the victim of artistic license and appeared more doglike and eventually as spotted dogs. Interestingly, the earliest written record of a dog being called ‘pointer’ comes from a leather-bound hand written book ‘The Generous Sportsman, or, a Brief Discourse of Setting Doggs’ by ‘A Lover of the Setting Sport’, ca. 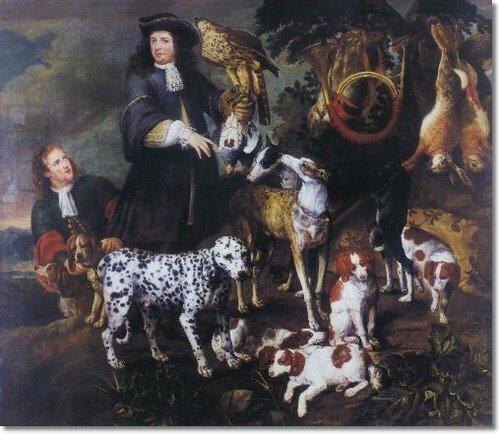 1725, which says “Should there omitt mentioning another kind of Doggs much in Vogue with some by the term of Naturall Pointer, by some called Spanish Trotter. I might be justly blameable which firsts term seems to appoint him out for the most kindly dogg in the world for a Setter, for what can seam more proper then.” One has to wonder if these might have been of the ‘outrunner’ type. 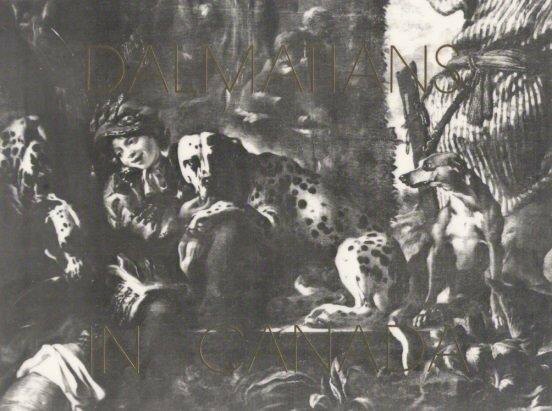 By the late 1700s to early 1800’s more artwork showing Dalmatians actually coaching appear, such as the etching below from Bewick (1791), and it is during this time period that the Dalmatian breed underwent great development in the UK. 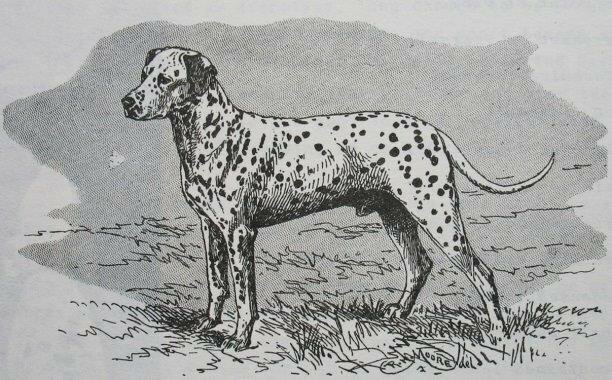 The earliest registered Dalmatians in the UK date from the 1870’s, and etchings of these early dogs show they were very typical representatives that could easily step into the show rings of today with success. Below are Eng.CH. Berolina, born 1887 (standing and on the move) and the liver Eng.CH. Fauntleroy, 1899. 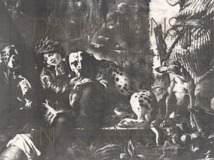 Another early painting by Fyt, thought to be from the 1640’s, also shows a very Dalmatian-like hunting dog. No matter what the original origin(s) of the stock which gave rise to the Dalmatian, an undisputed fact remains. The Dalmatian as we know it today was developed and nurtured in the United Kingdom, and virtually all, if not all, current Dalmatians worldwide can trace their pedigrees back to British stock imported into the various countries around the globe. This includes Croatia, where as previously mentioned, the first recorded Dalmatians were imported from the UK in the 1930’s, as well as the US where George Washington imported a male Dalmatian from England in August 1787. Thus, Dalmatians from the UK form the basis of the breed throughout the world today. Advances in medical research technology in recent years have produced a flurry of activity in gene mapping and the investigation into genes responsible for producing various traits. Future DNA mapping and screening will add to the ongoing research providing more tangible proof of relationships between various dog breeds and hopefully a better understanding of the Dalmatian’s origins and close relatives. Suffice it to say that the Dalmatian has remained a unique and largely unchanged breed for at least the past 200 years and probably much longer. The precise origin of the breed, the exact mechanism producing its unique spotting, and how the HUU gene became homozygous remain mysteries yet to be solved. Brooks, Dr. J.H. & Mrs. Monica M. 1982. Dalmatians In Canada. Bannasch, D., Safra, N., Young, A., Karmi, N., Schaible, R.S. and Ling, G.V. 2008. Mutations in the SLC2A9 gene cause hyperuricosuria in the dog. PLoS Genetics 4(11), e1000246. Schaible, R.H. 1976. Linkage of a pigmentary trait with a high level of uric acid and excretion in the Dalmatian dog. Genetics 83 Suppl No.3, p.s68. Hancock, Col. David. 1990. The Heritage of the Dog. pg. 120-126. Bewick, Thomas. 1791. History Of Quadrupeds. Fyt, Jan (1611-1661). ca. 1640’s. Painting ‘The Hunting Party’. "George Washington to George Augustine Washington, 12 August 1787," The Papers of George Washington, Confederation Series Vol. 5 (Charlottesville, VA: University of Virginia Press, 1997), 177, 287.